All people exist, but very few live. Why? Because fear of death brings slavery. A slave’s life is a low life of misery. 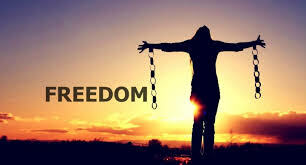 Without freedom, you merely exist but don’t live. Through His death, Jesus freed mankind from this slavery. John 1:4 “In Him was life, and the life was the light of men”. The Greek word for life is ‘zoe’, which is the God-kind of life. It’s the life which God himself enjoys. Jesus set us free by His death. Now God’s life in us brings development or growth in our lives. We are free to become all that God intended us to be! Eternal life is not something you will, one day, enjoy in heaven. Eternal life is what you start enjoying, the moment you believe in the sacrifice of Jesus. The moment of the new birth. Victor Torres received Jesus into his heart when someone shared the gospel of God’s love with Him. That day as he knelt on the street, God, set him free. He went to Bible school, and later started a successful youth ministry, which helped thousands of young people find freedom from drug addiction and gang life. He went on to become the pastor of a great church in Virginia. They have 22 churches all over the United States and the world. He travels all over the world, telling what God has done for him! Now that is the life Jesus came to give us. Dear Lord, we pray today that You would send people our way that are open to You so that we can share Your love with them. In the Name of Jesus, Amen.